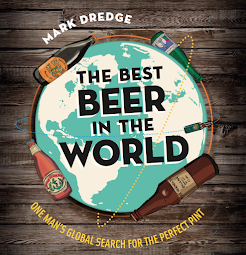 Mark Dredge - Beer: The Big Blogger Beer Swap! Count me in! I live in Manchester, so theoretically have access to a reasonably wide range of beers from NW breweries (although Manchester rather lacks a good bottled beer shop stocking local produce) and would be more interested in swapping on a specific geographical location basis, ideally the South West or East Anglia, on the grounds that I'm unlikely to get much Devon & Cornwall / Kent & Norfolk action unless I see it in the supermarkets. It has been a right laugh trying to find local beers for @realalereviews - we don't actually live that far away from each other only 70miles or so. we originally decided on 3 beers for under a tenner but that soon changed to 4. Im quite lucky to have some great bottling breweries right near me, but i've taken a chance and got some of their new beers that i haven't tried yet (gave me an excuse to buy some for me) i also tried to avoid ones that you can get in supermarkets so left hambleton ales out as they are appearing in more and more places now. other than that i can't say what i have bought but if you check out real ale reviews and beer reviews then you will no doubt find out sooner or later. as for drawing the people who match up...some sort of live tweet/semi live video draw would be good - happy to draw half of it if you want! I'm out of the swap, as I'd never get round to drinking the stuff, but if anyone has a particular need for Greater Manchester beers that Darren can't get hold of, I'm happy to try and source them from time to time at cost and get 'em to Darren for others. I have a lot of contacts, so I'll try and help out if Darren gets stuck. I agree with Barry, postage to Europe is probably a bit much. Yep, i'm in. No surprises what 3 of the bottles will be though i'm afraid! I can foresee problems with this, what with our half-arsed postal service! Count me in. I can source plenty of Derbyshire fayre. I'm obviously in as well! Good take up so far but I'm drumming for more so I'll post again next week. Barm, loving the logo, much appreciated! Cheers Tandleman, I might take you up on that one some time! Barry, Knut, it is a bit steep - £30 a box... Some might be happy to do that. How about posting to each other?! How would that work? John, that sounds awesome. Whether they are in the swap or not I'll be trying to get some! More than happy to work with Tandleman on sourcing and sending the Manchester / North West beers, aye. For the record, the last time I sent a couple of 330ml bottles by first class post (via Royal Mail) it cost a fiver, or thereabouts. Presumably there are relatively cheaper options for larger parcels via Parcelforce etc. I've just temporarily moved to the Peaks nr Buxton (so any tips on what are/where to find good Derbyshire, Gr. Manchester beers much appreciated) but spent the last 18 months researching Sussex, so if anyone is interested in those beers, I'm in. Count me in, I live in Cheshire and can reach a good number of micros including my own. Quick update - i think i have found a cheap and easy postage solution - just going to double check the details then i will let you know. I'm not a beer blogger, more of a photoblogger that likes to take pics of beer! Would love to be involved. Have loads of local micro's in Amber Valley, Derbyshire. In fact I've been invited to one this weekend for some mobile blogging. In of course Mark and looking forward to it! Nice to see you on here mackney - i'm sure there will be room for you. I have just packed the tester kit up now and it will be winging its way out of my door tomorrow. the package weighs about 5kg for the 4 bottles and packing and the postage was £4, i just hope it gets to it's destination. @richardmackney @simon contact me via reluctantscooper.co.uk and we can make sure we don't replicate each other! Cheers for this everyone. I will put up something over the weekend. Thinking that we should extend the end point until mid-Decemeber to allow more time for the whole thing - there's no need to rush. The post at the weekend will sort out how we manage this all logistically, etc, and how we choose who to send to. I'm thinking we create a north/south divide and swap that way... we'll see! The first package went this morning without a hitch - fingers crossed it gets there and gets there in once piece! The north south divide sounds like a good idea. is there anyone up in Scotland taking part? Just on the £4 postage, Mogg has found a great little courier that delivers via local newsagents and could be a lot cheaper than Royal Mail. Got my text message this morning to say our test run beer swap has been collected and is on it's way to me. Should be picking up from the corner shop today or tomorrow! If it's ok with everyone (@simon @reluctantscoop) I would like to cover Nutbrook Brewery in West Hallam as I am there tomorrow to watch the process. Cracking idea Mr Pencil-Spoon, I would love to be involved. I'm in Cardiff, so I'd happily provide beer from South Wales. Told u it was a good Idea mr dredge! Have we got Devon and Cornwall, Liverpool and Scotland covered?? Moggy, I think we've got North West, I hope we can get Scotland (I want Barm in or Brewdog! ), we do need South West, Tierney-Jones is the only blogger I know down there, except beeradventurer, although that's changing hands, I think). Neil, Simon, sorry I didn't acknowledge you guys earlier - great to have you, and Neil, are your beers homebrew or commercial? Richard - jump on board mate!! Beer Bear, Wales is all yours! We've got a couple of breweries in too, so the whole thing is expanding fast. This is good. I think we can get more too. I'll post on Sunday. Until then, use #beerswap on twitter and make it something BIG!! I'm in. I'm just drinking one of my potential candidate beers. It's awful, so no longer a candidate. OK, so how do you know who to send to and how many bottles. I'm in BTW...but you can't have my 1999 Fullers Vintage I lifted on Monday, sorry. I will put up more details on Sunday, including a finish date (which will now be mid-Dec, I think) and how to sort out details, but I'm thinking that 4 bottles is fine (more if you like, but 4 is ideal) and we'll seperate North/South and cross swap between so there's lots of inter-linking going on (maybe a live draw on twitter? - if Moggy is up for that?). Non beer bloggers might get a different draw but I'm not sure yet... any ideas are very welcome! !